[Post-it note on back]:American Legion Hall by Peg Tree Condos on Leonard Street. Description Photo creased. Front L to R: Harry Trueblood, Anna Eberly, Herman Blanken, Charles Bamford. Back: Myron Crommett, Simpson Bragg, Mateo Scuito, Joseph Woolery, Letcher Nelson, John Bosque, Ted Farmer. Info. 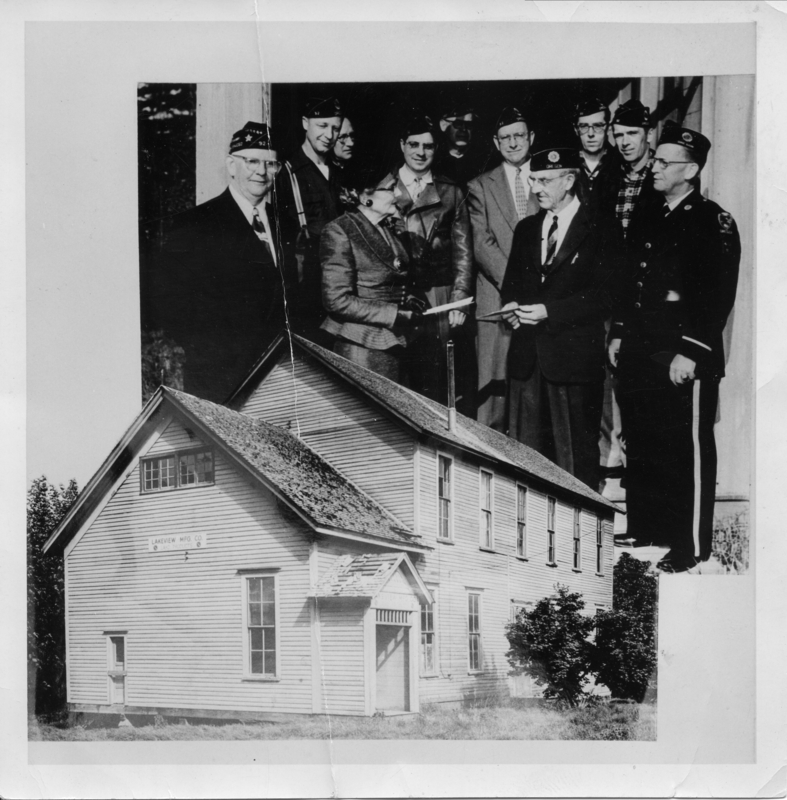 from Dec. 1954 article in ""The Oregon Legionnaire"" [in American Legion Scrapbook]: Deed to the old Grange Hall is given by former owner, Mrs. Eberly, to Post Commander Blanken. [sign on building]: Lake View Mfg., Lake Products. Transcription [Post-it note on back]:American Legion Hall by Peg Tree Condos on Leonard Street. Physical Description H 5.5"" x W 5.5""